Perfect for your Easter Table! These beautiful butterfly eggs are as simple as can be. They would be perfect on a tray for your easter get together, or use them on your table at each plate and pipe on a name for a place card setting. 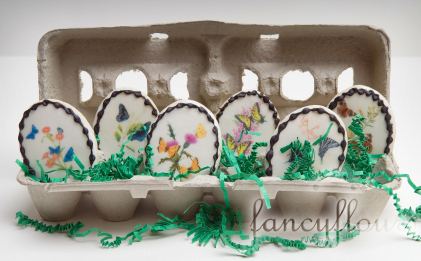 You will need the Butterfly Assortment Wafer Paper set at fancyflours.com, as well as an egg shaped cookie cutter and royal icing mix. 1. Simply cut out and bake cookies as usual. 2. Let cool and then ice with royal icing. 3. Cut out wafer paper shapes using small craft scissors. 4. Apply thin layer of corn syrup to back of wafer paper design and affix to the top of each cookie. 5. Flip cookie upside down on waxed paper for about 30 minutes (this will ensure the transfer dries flat). 6. Flip cookie over and add any additional piping as you wish. This entry was posted in Easter Treats, Instructions & How-To's, Spring Baking by Fancy Flours. Bookmark the permalink.